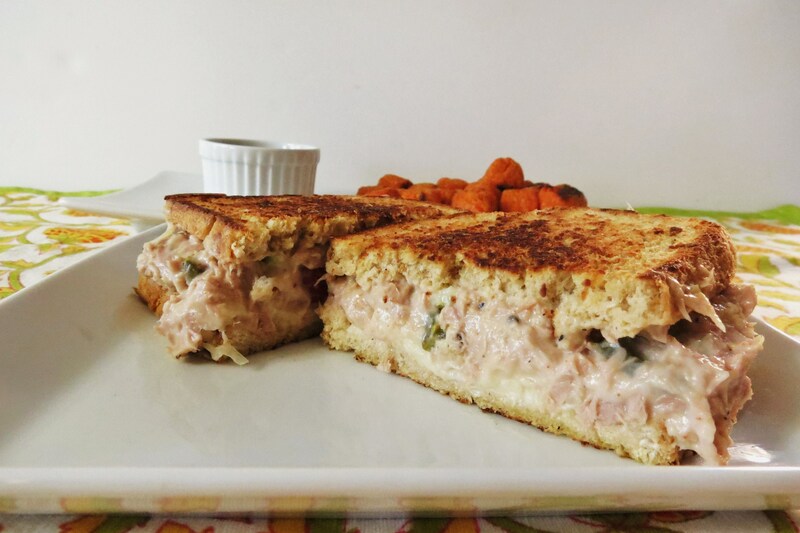 I was going to post tonight a recipe that I fell in love with this weekend, but then I made dinner tonight and I just had to share with you my wonderful tuna melt. I know nothing fancy, pretty simple, but it was so good. I haven’t had tuna in over a year and after digging through my cupboards for something to eat I saw a packet of tuna and thought, why not. This was the first time I have ever had and made a tuna melt. My boss always orders them and they look good, but I normally order a salad for lunch, which is what I did today. So I decided to make this fat, messy, sloppy sandwich. You know those kind are the best. I apologize for the photo’s, tuna, at least for me didn’t come out in pictures liked I had hoped, oh well. I’m a food eater, not a photographer. I did the best I could to make it low-calorie, but the protein and fiber make up for it. 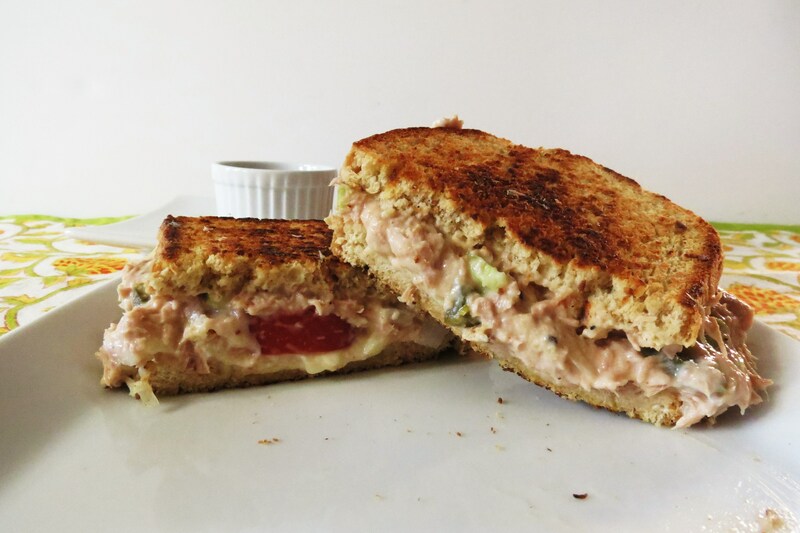 I used homemade light wheat bread, tuna in a water pouch, reduced fat mayo, celery, onions, picked jalapenos (You know I had to throw peppers in there somewhere), paprika, ground pepper and light mozzarella cheese. A nice cheddar cheese would go well with this sandwich, but I really need to go grocery shopping, and all I had, was mozzarella. It worked perfect in book! All day I kept thinking, I want a sandwich and just knew I was going to have one tonight, so I did save all my calories for this bad boy. I also served it with Alexia Sweet Potato Puffs and Spicy Ketchup. I love those dam sweet potato puffs! My dinner was perfect. I just LOVE fend for yourself night. No one in my house eats tuna, so this was a perfect Jennifer Meal. In a small bowl add the tuna, 2 tablespoons of mayonnaise, celery, onions, jalapenos, ground pepper and paprika. Mix until combined. Spray outside bottom piece of bread with spray butter. 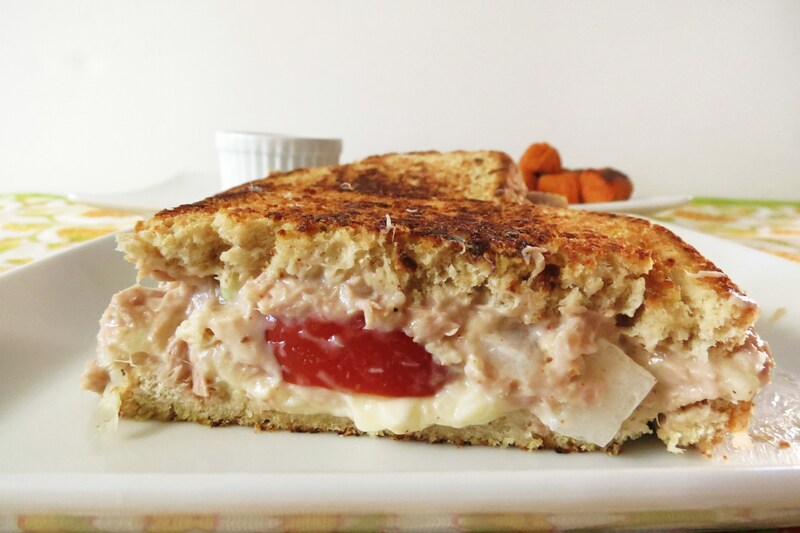 On non-butter side of bread, place tuna mixture, than top with tomato slices and cheese. On other piece of bread add 1 tablespoon of mayonnaise on inside piece. Place on cheese than spray top piece with spray butter. Place sandwich in a skillet and cook until bottom is lightly brown. I really loved this sandwich and it was so filling. I normally have a bowl of yogurt for dessert, but not tonight, I am stuffed!! You gotta love these fat, messy sandwiches!! Yum!!! I see another one in the close future!! Monday I had my official two-week weigh in. It’s part of the Spark People program that I belong too, and I only lost 1 lbs. in two weeks. I’m not to happy with that. I have 6lbs to lose to hit my personal happy weight. It boggles my mind that I eat within calorie range, workout for the most part and I eat pretty darn healthy. So I tried to figure out what is going on and a horrible realization came to me. Maybe it’s, do I dare say it? Peanut Butter! Yup, I don’t measure it when I put it in my yogurt or anything and sometimes when I want something sweet I’ll take a tiny spoonful, but I’m not to worried of the fat part, but I’m worried about the calorie part. So, you better sit down for this, for one week and one week only I will not put peanut butter in any of my foods or take it by the spoonfuls. I’ll keep exercising and eating like normal. If I lose 1lbs. this week, than I know it’s peanut butter. Now don’t think I’ll give it up, that will NEVER happen, but all that means is I have to portion out my tablespoons. Which is no big deal! I should actually just do that, but I want to experiment with the no peanut butter, just for one week. So far so good! Now that doesn’t mean I won’t eat peanut butter cheerios, or a peanut butter granola bar, it just means no peanut butter straight from the jar. I will still use it in cooking and baking, just not for spooning. 🙁 So I am excited and sad to see if this works. If nothing happens, all bets are off and I’m back on the jar! he he psst… I hope it doesn’t work! Sorry, I don’t mean to be a pest, but if I don’t ask, than nothing will happen. As you may know I was nominated for Best Healthy Eating Blog through Fitness Magazine, he he and I would love it if you would vote for me. Please! Just go here. Thank you!!!!!!!!! That sandwich looks insane. And those sweet potato puffs = best.thing.ever. 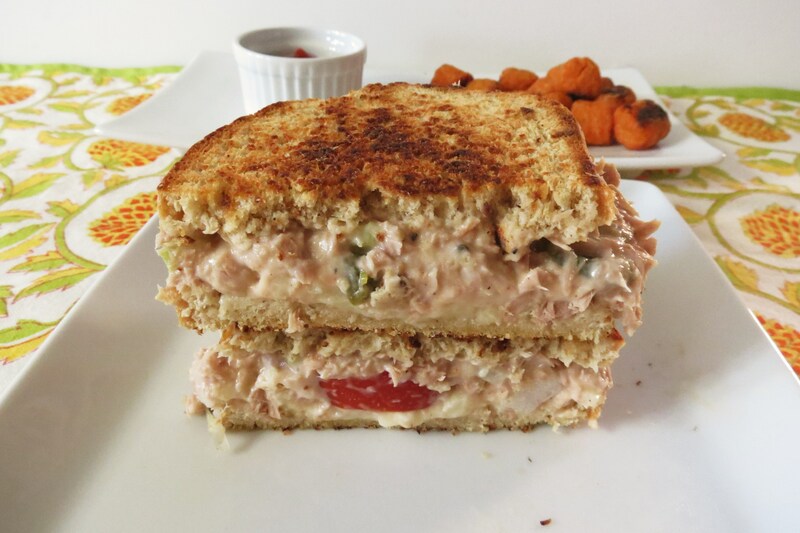 One of my best friends loves tuna melts and she is trying out a new “healthier” diet so I’ll have to send her a link to this one! As for the peanut butter…I’m pretty sure I could loose those last few pesky pounds if I cut it out completely! I love it WAY too much. I have been measuring it out and limiting myself to 1-2 tablespoons of nut butter a day and it’s been pretty good. I was able to loose 5 pounds to get down to my “happy weight” by doing this (along with lots of exercise) so I recommend having that glorious pb in moderation (even though it’s completely blasphemous that we should have to limit something so amazing!) Good luck! 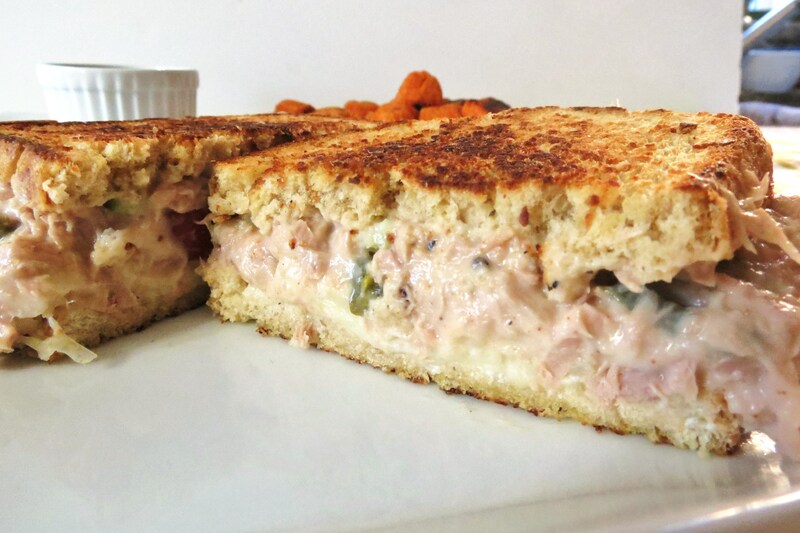 I love grilled tuna sandwiches and yours looks great! I’ll be using Ezekiel sprouted wheat berry bread @ 80 calories a slice. I’m also a peanut butter fanatic. I use Better than Peanut Better (at Trader Joes) and I just bought PB2 powdered peanut butter that has 85% less calories (purchased on Amazon) and it is wonderful! I sprinkle it in my hot cereal and use it in Asian soups…possibilities are endless. I tried the Better than Peanut Butter and I don’t like it. I think my down fall is, that I LOVE my own peanut butter. I rarely by the jar stuff. I just use it for baking or desperate needs. I’ve heard of the PB2 powdered peanut butter, I think I’ll try that and see how that goes. Do you add water to it? How does it work? I bought the PB2 to use as a powder for muffins, pancakes, soups, and my hot cereal mixes. Directions say to add water to make into peanut butter, but I only wanted the defatted powder version for cooking 🙂 The Better than Peanut Butter version is way too sweet but I use it for a quick fix. I’ve added vanilla protein powder to it to pump up the protein but still have a weird little spoonful of dessert! Great idea for cooking. I love that! I’m going to look for it on Amazon! Yummm. I have so many cans of tuna in my pantry because I keep forgetting I have some when I’m at the store… This looks like a GREAT way to use those up! And NO peanut butter? I already had some breakfast today. I could probably do a week but, like you, I could not give up peanut butter. It’s just too darn good. Hi Cassandara, I know I keep buying tuna too with good intentions then I don’t use it, glad I found a use Monday night. 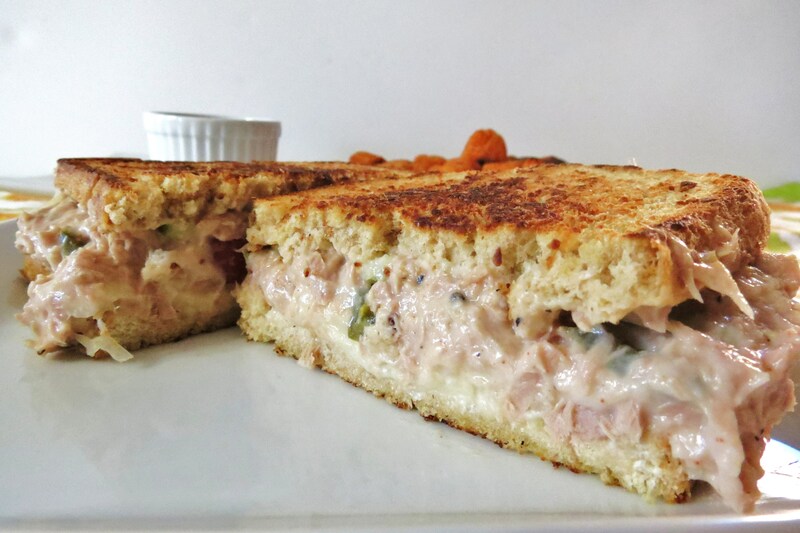 The tuna melt was great and I will definitely be making it again soon! Yah, giving up peanut butter is hard, harder than I thought, but I can do it till next Monday, than all bets are off!! It’s delicious! I made it for dinner the other night and it was just as messy as you said. Great recipe! 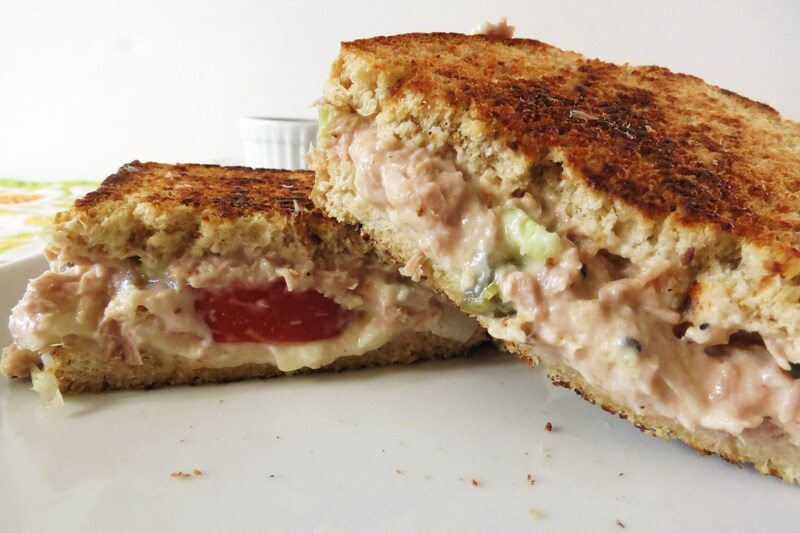 I love a good tuna melt, very satisfying with lots of protein! Thanks! Sometimes certain foods just don’t photograph great, but in my opinion if it tastes great thats all that counts!! We grill sandwiches the EXACT same way! 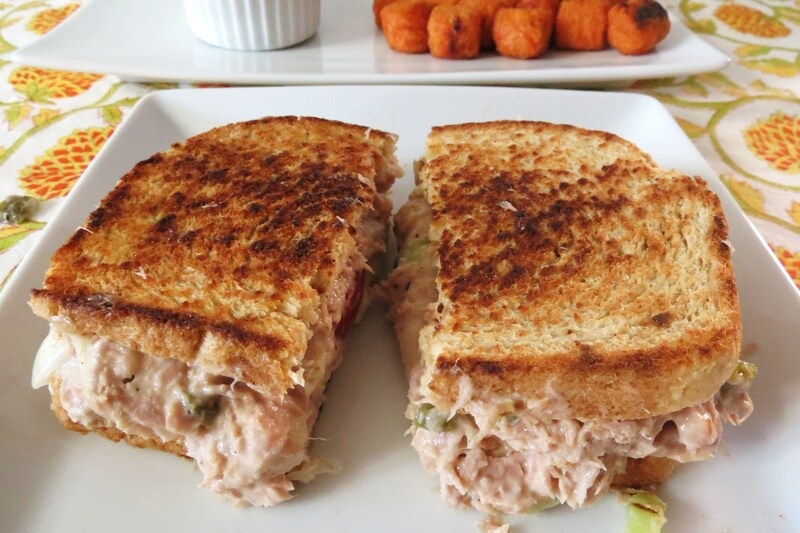 This sandwich looks amazing…and I hate it that I’m allergic to Tuna! The sandwich looks SOO good!